Today, many homeowners are gravitating towards taking a modern outdoor living approach when designing their backyard. One of the most popular services in the landscape architecture industry today, is the addition of outdoor living spaces to a property. These spaces are designed and created into fit any size space, for any style preference and work within any size budget. Our firm, along with our sister company, Scenic Landscaping, specialize in the design, installation and maintenance services needed for outdoor living spaces. We work closely with our clients to understand and design the ideal outdoor living space to suit not only the property but also the lifestyle for each homeowner. The first step in creating a modern outdoor living space is deciding on how this outdoor room would ideally be used. Depending on your lifestyle, family, entertaining plans and property size, you will find different elements that would work best to provide maximum enjoyment. Whether this modern outdoor living space is for relaxing by a fire, cooking dinner on the patio, watching TV on outdoor furniture, or a bar and cabana to entertain poolside, we will work with you to create this new perfect space. An outdoor fireplace or firepit is a nice addition to the backyard. They provide a room that is able to enjoyed all year long. With the climate on the east coast, a warm fireplace is appreciated in the cold winter months through the chillier summer nights. We can customize a fire feature to your liking. All of the masonry, stonework and materials used can be chosen by the homeowner all will be utilized to create the perfect piece. A fireplace often serves as an anchor to the outdoor living space, it is where people congregate and relax, a place of peace and focal point of the property. 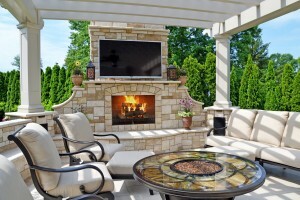 Lately, we are seeing many homeowners choosing to add an outdoor television on top of their outdoor fireplace. This provides another element of entertainment and luxury, there is nothing better than getting to watch sporting events with family, in your very own backyard. Another popular feature to modern outdoor living spaces, is building an outdoor kitchen. An outdoor kitchen is a feature everyone in the family loves. In the warmer seasons, being able to BBQ and enjoy a meal outside with loved ones is a luxury. Whatever type kitchen you are envisioning, we can create. From the addition of an outdoor built in fridge, or bar, or pizza oven, we can incorporate. We install high quality appliances to ensure you are getting the very best out of your investment. If you have a pool in your backyard or are considering building a new one, other modern outdoor living spaces are ones that amplify the pool area. Patios, pool bars and cabanas are outdoor living spaces that make the pool on your property even more utilized. These create the ultimate party space, and transform your yard into your own personal resort. Hosting parties in the summertime, or relaxing with your family on a warm summer day poolside at your own outdoor bar is the ultimate escape. There is no need to travel to resorts to brave the crowds at the beach, when you have everything you could possibly need right outside your own door. The landscape surrounding your modern outdoor living space is another important element to remember. The landscape surrounding your new kitchen, fireplace or pool area will tie everything together seamlessly. Plantings are used to provide intimacy and privacy, enclosing these outdoor living spaces into their own personal rooms. Our talented architects and designers will work with you in creating the ideal landscape that will work with the new addition of a modern outdoor living space. Whatever type of outdoor living space you are considering, we will be able to make it work for you. An outdoor kitchen, outdoor bar and bbq, fireplace or fire pits, cabanas and patios and anything else you would need to create the perfect space, we will be able to provide.